"This is the result of a lot of deep reflections with company JMF Audio. I was a great fan of their amplifiers, but also of their mentality and approach regarding monitoring. By identifying my needs, they offered me this set-up we tested out. This was, in my sense, the right answer to my needs. My set-up goes straight from the console to the amplifiers, which gives me the most straightforward sound". Nicolas Stawski (Nico Staf) has been one of the most demanded sound engineer in France (multi platinium albums) and previously worked freelance in famed studios (Studios Grande Armée Paris, Larrabee Studios Los Angeles...). 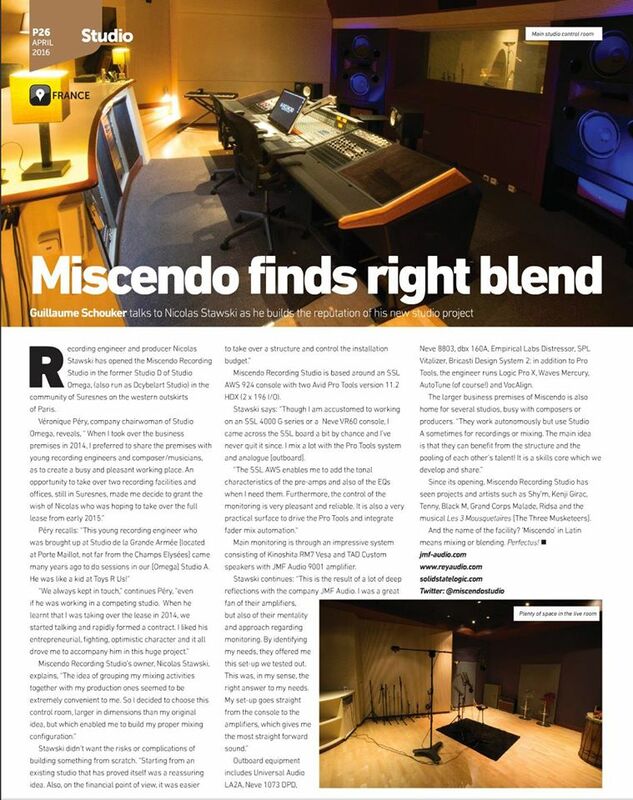 The Miscendo Studios are equipped with JMF Audio HQS 9001 power amplifiers, PC3 power cords, SR8 speaker cables, custom monitors (20Hz); which make it one of the largest and finest standalone monitoring in operation in the world. Congratulations Nicolas.